Provide effective temporary water treatment in a remote location. 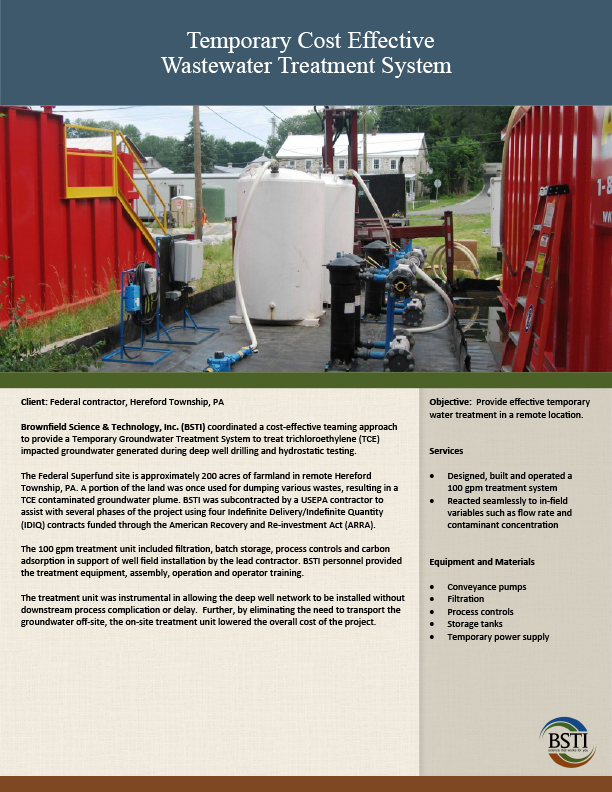 Brownfield Science & Technology, Inc. (BSTI) coordinated a cost-effective teaming approach to provide a Temporary Groundwater Treatment System to treat trichloroethylene (TCE) impacted groundwater generated during deep well drilling and hydrostatic testing. The Federal Superfund site is approximately 200 acres of farmland in remote Hereford Township, PA. A portion of the land was once used for dumping various wastes, resulting in a TCE contaminated groundwater plume. BSTI was subcontracted by a USEPA contractor to assist with several phases of the project using four Indefinite Delivery/Indefinite Quantity (IDIQ) contracts funded through the American Recovery and Re-investment Act (ARRA). The 100 gpm treatment unit included filtration, batch storage, process controls and carbon adsorption in support of well field installation by the lead contractor. BSTI personnel provided the treatment equipment, assembly, operation and operator training. The treatment unit was instrumental in allowing the deep well network to be installed without downstream process complication or delay. Further, by eliminating the need to transport the groundwater off-site, the on-site treatment unit lowered the overall cost of the project.